This image is the result of using visualization to share knowledge in class. I’ve used lets-focus, a business mapping software, over a network. Master students were working in groups; each group had a laptop with the (empty) template above – called perspective diagram. 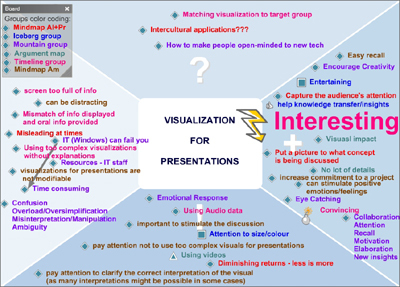 They were asked to brainstorm on the topic of Visualization for Presentations: advantages/good practices, disadvantages/problems, issues and open questions. Then I asked them to send their ideas (icons and text) to my computer through the network. When they sent a contribution it was visualized in real time on my computer, which was connected to the class projector, therefore everyone could see the development of the visualization. Each group was assigned a color, so that the owner of each contribution was identifiable. It also helped to motivate groups to contribute equally (visual pressure). The ideas sent by the students were then commented and placed into the context of the discussed topic and of the course. The game worked out very nicely, it seems a promising way to enhance teaching. Firstly it lets the students experiment an innovative tool that can be used in organizations for knowledge sharing and brainstorming. Secondly it engages student to participate actively in class, learn from their peers and re-elaborate their knowledge by visualizing it. The results are very promising, I believe there is a great potential of application for this kind of visual groupware, both in organizations and in education, on which I would like to experiment more in the future! This entry was posted on Wednesday, March 10th, 2010 at 11:25 am and is filed under Uncategorized. You can follow any responses to this entry through the RSS 2.0 feed. You can leave a response, or trackback from your own site.